As you may have heard, there’s an eclipse of the sun today. Anyone in North America can see it. Here in New Hampshire, USA, we’ll only see a partial eclipse, but it’s still exciting, and conditions are near-perfect: a nice clear sunny day. What’s even more important than the eclipse itself? 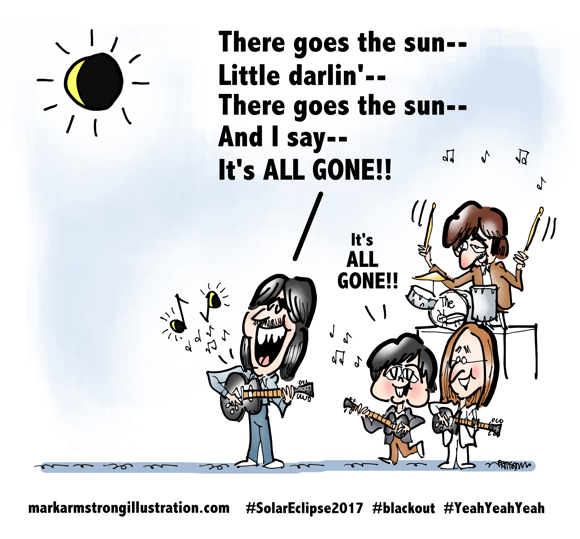 Well, if you’re a brand (like Mark Armstrong Illustration, for example), you simply must post something about the eclipse on your blog and all your social media accounts, or else risk looking uncool, unhip, and hopelessly out of touch. So here’s my take, with some help from George Harrison and an obscure Liverpool group called The Beatles. George’s two biggest contributions to the Beatles songbook were Something and Here Comes The Sun. I modified the lyrics to the latter, because… here comes The Moon!! Thoughts? I’d appreciate your feedback. 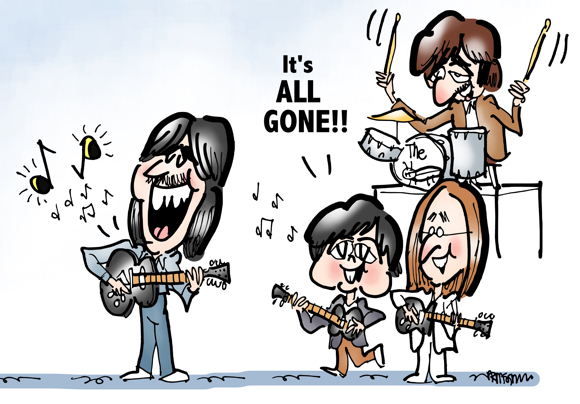 You might also enjoy this Meet The Beatles parody. Love it! Paul’s teeth especially made me smile. Ha! Yes, Sir Paul was all eyes and all teeth, set off by what used to be a large floppy Beatle wig! Yesterday… all his wrinkles seemed so far away… his and mine, both! Always great to hear from you, hope you and yours are having a lovely summer! Hi Mark… excellent caricatures of the group, and so witty! Yes, it was a great day to watch the eclipse, couldn’t ask for nicer weather. Hope you enjoyed it as well. Thanks a heap for your kind comment. It means a lot coming from a great caricaturist like yourself. Onward! Hi Liza, thanks so much for your kind comment. I’ve always done my line drawings by hand using plain ol’ markers and paper. Then I scan them into my computer. I used Adobe Photoshop for many years, then lost it when my old computer died. I decided I didn’t want to pay an ongoing monthly fee for the new Cloud-based version of PS, so I took a chance and paid $30 for Pixelmator which I could download onto my machine. It’s a great image-editing and coloring program, and I’ve been using it for a couple of years now. You can read more about my making the switch in this post. Nice to meet you, thanks for stopping by! Thanks, Alison– always great to see you!